As I have a longlasting interest in ethnology and indigenous cultures, I decided to feature here some interesting man-made artifacts. Since this blog is mainly about animals, those objects will be of course zoology-themed. When I recently visited once again the National Museum of Denmark at Copenhagen, I could take a lot of really interesting photos. This monumental museum does not only have a wonderful exhibition about the history of Denmark (including the bull of Vig, one of the most complete Aurochs skeletons in the world), but also a stunning collection of archeological and ethnological objects from other areas of the world. Because Greenland belongs to the kingdom of Denmark, the exhibition of inuit artifacts is particularly rich, and quite probably one of the best in the world. I´ve been always particularly fascinated by the traditional culture of the inuit, and especially interested in their extremely advanced crafts. Compared with stone-age hunter-gatherers from other areas of the world, their level of technology was absolute hightech and many of their objects of utility were surprisingly complex and functional constructions. That´s even more surprising, as the inuit had only an extremely reduced access to many natural resources. Except for stones and driftwood, the base for nearly everything else was from the bodies of various animals. This tools have cutting edges made from shark teeth, which are inserted into notches of the wooden handles and fixed with fine, apparantly wooden bolts. Tools and even big weapons like spears and swords with cutting edges made from shark teeth are well known from Oceania and found in many museums. But they are quite rarely seen among inuits. The reason for this is possibly because inuits had- quite in contrast to coastal peoples of Oceania- quite little contact with sharks, as there aren´t really many sharks in arctic waters. The only shark which inuits sometimes encountered, was however a really weird one, the unearthly sleeper shark Somniosus microcephalus. This stolid giant, which can not only grow to pretty big sizes but also live for several centuries, was occasionally caught or found dead by the inuit, and its teeth and skin found sometimes use, whereas its meat was fed to sledge dogs and its liver was used to make oil. But there was not much knowledge about this cryptic denizen of the deep, which has -quite in contrast to many other arctic animals- next to no place in cultural memory. There was no targeted hunting or fishing for sharks, and the inuits learned mainly about their existence when they scavenged on seals caught in seal nets. Today they are often caught as unwanted bycatch in halibut fishery, but this started only a few decades ago, as there was not much traditional fishing for halibut. 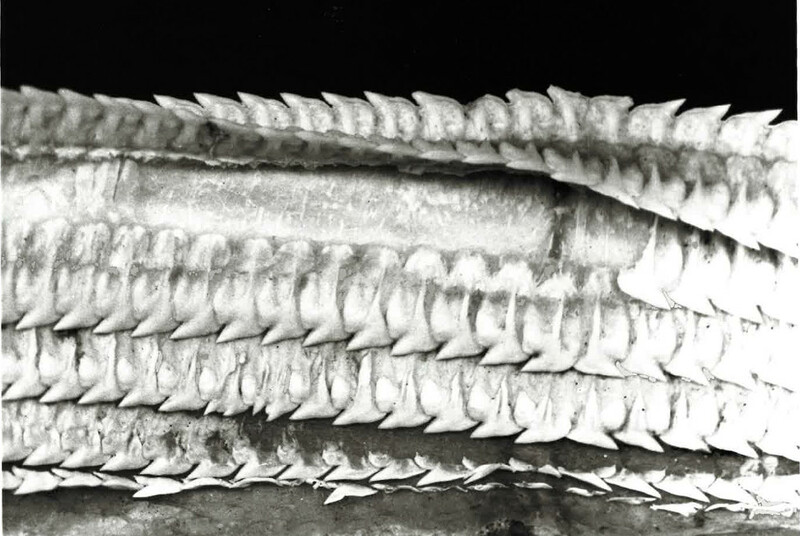 Greenland shark teeth of lower tooth rows, detail. 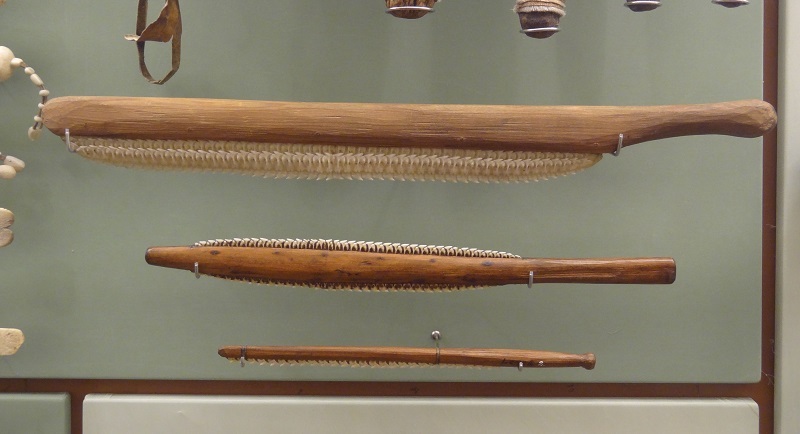 In contrast to Oceanian shark tooth tools, which are usually (but not always) made from single perforated teeth which were fastened with threads on the handles, this tools are made from the whole tooth rows. The lower teeth of sleeper sharks are tightly attached to each other, and shed in the whole instead of tooth by tooth. This makes it of course easier to remove the whole tooth row or even several tooth rows at once from the jaws and use them like a saw-blade. I don´t really know for what they were used, perhaps for cutting up the carcasses of seals or whales. 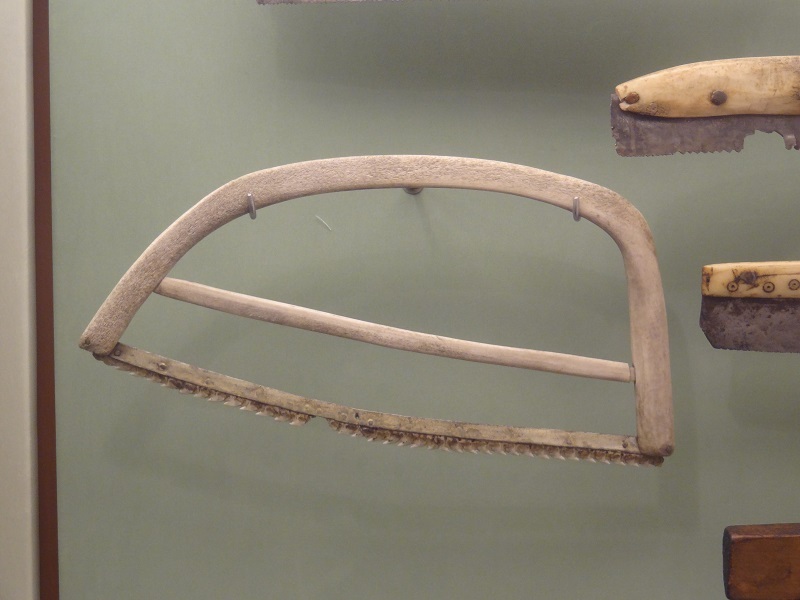 The two smaller ones look however suprisingly similar to tools illustrated in Jensen´s „The selachians of Greenland“, which were used as haircutters by the inuit. There was also another interesting tool made from the teeth of a Greenland shark, which was the weirdest saw I have ever seen. All in all, it was shaped like an ordinairy hacksaw, but made of fully different materials. 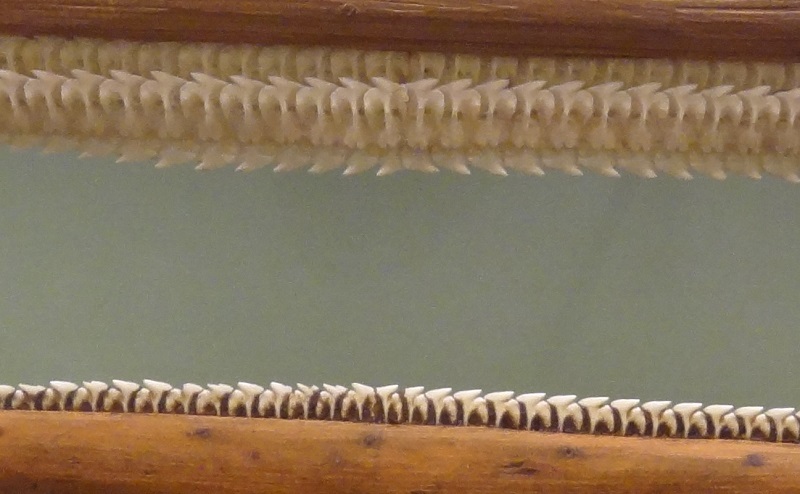 The cutting edges were shark teeth, and the frame of the saw was either made from reindeer antler or possibly carved out of a big piece of whale bone. It´s noteworthy that it includes some small metal pins, what means that it was made by inuit which had already contact with Western sailors. They are many wonderful examples of western tools imitated by inuit craftsmen by using the materials they could use, like ivory scissors, sometimes made with thin blades of scrap metal riveted to the ivory. The whole exhibition about the inuit was not only about their culture and environment, which has shaped their unique way of life. All those artifacts showed also the animals of their native land, which only enabled them to live in this inhospitable part of the world. Idrobo, C.J. and F. Berkes 2012. Pangnirtung Inuit and the Greenland shark: co–producing knowledge of a little discussed species. Human Ecology 40: 405–414. Jensen, A. S. 1914. The Selachians of Greenland. Copenhagen: Bianco Lunos Bogtrykkeri. Dieser Beitrag wurde unter Anatomie, Curiosity of the Day, Ethnology, Fische, Haie und andere Knorpelfische veröffentlicht. Setze ein Lesezeichen auf den Permalink.